I know how hard it is to believe that you could make potato salad with cauliflower salad but hear me out. This is a wonderful “low carb” option the replaces the heaviness of potatoes – which you don’t want in the summer anyway –right? Frankly, I am bored with potato salad. Snore. Some of you have complained about my love of cauliflower because it makes you root-a-toot-toot but I will not stop creating with it – why? Cauliflower is an excellent source of vitamin C, vitamin K, folate, pantothenic acid, and vitamin B6. It is a very good source of choline, dietary fiber, omega-3 fatty acids, manganese, phosphorus, and biotin. Additionally, it is a good source of vitamin B2, protein, vitamin B1, niacin, and magnesium. How many foods can you say that about? And it is low in calories versus the carb rich potato. This potato salad with cauliflower works because you don’t cook the cauliflower into mushiness. 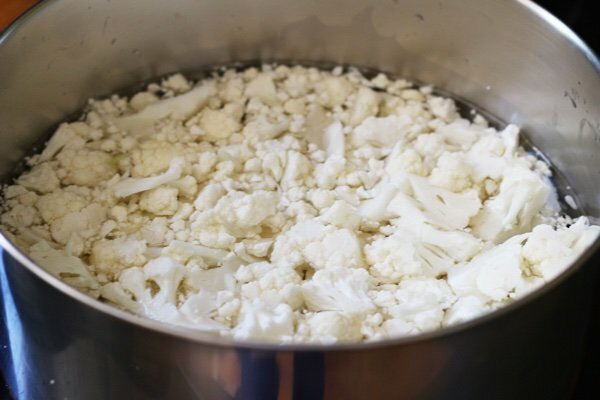 Heat up the cauliflower in water that almost covers it and then drain it immediately when it gets to a boil. This will ensure a crunchy but cooked texture that will remind you a wee bit of a potato. Then you make a sauce that is very similar to actual potato salad and toss it together. I like to garnish it with some chopped green onions and smoked paprika. Smoked paprika is one of those spices that I want to pour on absolutely everything (ice cream? Yes!). It is so rich and tasty. Ahhh. Keep this in your fridge and add it to your lunch all week. Your coworkers will admire your brilliance as you announce that it is cauliflower. For other low carb cauliflower recipes try my low calorie rice and my low calorie Alfredo sauce. Have you tried a potato salad substitute? What works for you? Add cauliflower to a large saucepan and add water to almost cover. Heat until just about to boil and drain. You want the cauliflower to retain its crunch but not be too crunchy. Add cooked cauliflower and eggs to a large bowl. Mix together mayonnaise, yogurt, mustard, relish, and vinegar in a small bowl and pour over cauliflower. Blend and taste for salt and pepper. Garnish with chopped green onions and smoked paprika. I always include diced bell pepper and celery along with scallions in my potato salad. I'll replace the potatoes with cauliflower in my recipe and use your mayo/yogurt dressing. Great summer low carb dish. Here's hoping! By the way, I made a Tex-Mex dish using cauliflower rice that was delicious and so healthy! My husband didn't realize he was eating cauliflower and said it's one of his favorite dishes. You rock, SnackGirl. Keep pushing us out of our comfort zone! I love it! You can substitute cooked rice for the potatoes also but use your fixings like when you make it with potatoes. The taste is just like potato salad, just a different lighter texture. Brilliant idea! I'll try it--as soon as I finish the bowl of leftover potato salad in my fridge. Hi Lisa, love your recipes but I was just wondering how do you figure the nutrictional values of your recipes? Do you plug them into a certain web site?? 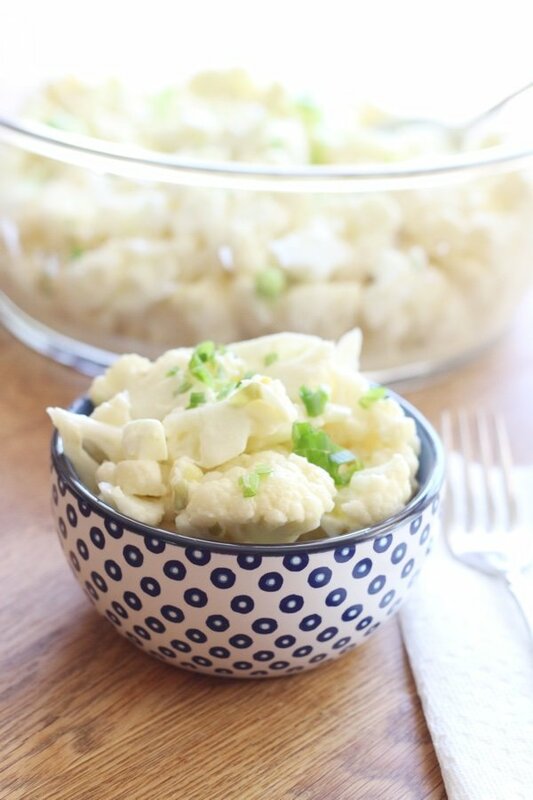 I make cauliflower potato salad all the time. I add all the things I would add to my regular potato salad....celery, onions, hard cooked eggs. I use 50/50 fat free plain greek yogurt and light miracle whip. I've never tried cooking the cauliflower before, but I'll give it a shot. My kids like this too! Well doing straight cauliflower may not go over well with my peeps, but if I did half and half that would be better. 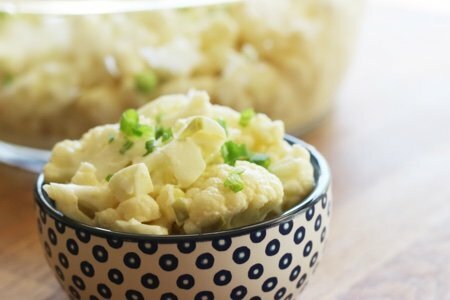 Interesting, Cauliflower replacing potatos in potato salad. I have always been a meat & potato kind-of-girl. I can't see replacing a household staple like the great Idaho Potato. I will keep a open mind, prepare this recipe, and let you know how my family reacts. I make this for my family. When company come, I add two potatoes and they love it. It gets them to try it with a open mind. This sound good. I use cauliflower all the time, just not cold. Not sure how this would taste cold. I guess I'll have to try it to find out. Thanks for the recipe. Hope the hubs likes it too. He is a potato fanatic. I did it! I can’t have potatoes (or rice.. starchy foods cause me to retain fluids due to heart failure) but I used my own potato salad recipe with onion, celery dill pickle, black olives and eggs. I mash the yolks with mayo and mustard and season with pink salt and black pepper and garnish with dill weed and omg!!!! It is awesome! I cook my cauliflower whole and then remove the stalk and crumble it into small florettes after soaking in cold water til cold. I cooked the eggs in the same pan and they were perfect! Thanks for the idea!